I fanned the cards so she could pull one. She inspected the variety of colors and bits of images carefully, zoomed in on one and pulled it from the deck. “The Compassion card,” I said. “And that means Self Compassion.” Her eyes teared up immediately. “I’m not that good at that”, she said softly. She sighed and I could feel some tightness and constrictive energy within her lift. This wasn’t the first time I had a conversation like this with a client. Actually, I’ve had countless. Each time it moves me because I can remember how for years and years this was my own experience. I used to beat myself up for not doing or saying something ‘right’. An inner voice would berate me with so much judgment and criticism, and it left me feeling confused and inharmonious a lot of the time. Days could be consumed by my mind running the tape over and over. The feelings of shame and guilt would also consume me as the tapes ran. Sometimes I would talk it out with someone and that would often times help some. But the only real way for it to dissipate was time. Even then, though, when I re-visited it, that feeling of shame could still come back. I’ve asked my clients (and myself) where this need to chastise ourselves comes from. One of the things that comes up is a belief deep down that if we don’t, we’ll stop trying or that we will become complacent. Somehow we were taught that we need to be tough on ourselves in order to achieve what we want to achieve. And of course this isn’t true. We all know that having a supportive person (external or internal) cheering us on is a lot more pleasant and encouraging than someone who is yelling at us. Now I can hear proponents of ‘tough love’ protesting. And to those I would say that yes, sometimes we need someone to challenge us and tell us to keep going, but we never have to do that with criticism. There is so much power when we can inspire and challenge and encourage with compassion — and in our compassion, we can be still be strong and willful. With self-compassion, there is room for curiosity, discovery and growth. When you offer yourself compassion, you can step back and let go of the judgment. For me, I learned this amazing tool by learning to hear myself — the words I was using and the way I was speaking to myself. You can read about that process in The Story of Compassion. It’s a great exercise to take some time to really listen to how you speak to yourself. And to notice how others speak to themselves as well. If you’re not used to this, it takes a bit of practice since we have these internal dialogues without even knowing it. We can limit ourselves in so many ways that we don’t even realize with these dialogues. With a strong Self-Compassion muscle, so much is possible. Without it there can be a lot of those feelings I often felt those years ago — shame, guilt — and even things like anger, regret, sadness. We can easily get stuck here. Like I did, we can waste a lot of time and energy needlessly. These feelings can then easily be transferred to our relationships with others. When we don’t exercise that self-compassion, it’s much easier to miss opportunities of being empathetic with others. When we show ourselves Self-Compassion, we give ourselves permission to not be perfect. We realize we’re learning and doing the best we can. We can then recognize this when we see others who aren’t perfect. With Self-Compassion, we have more understanding — of ourselves and of others. We can see sides of us and of others and know these are just sides. They don’t define us. Without the energy of resisting them, these parts of ourselves often soften or perhaps it’s just that we soften in their presence. Either way, Self- Compassion leads to much more peace and acceptance within. This post was adapted from and added to a previous post from September 2016. 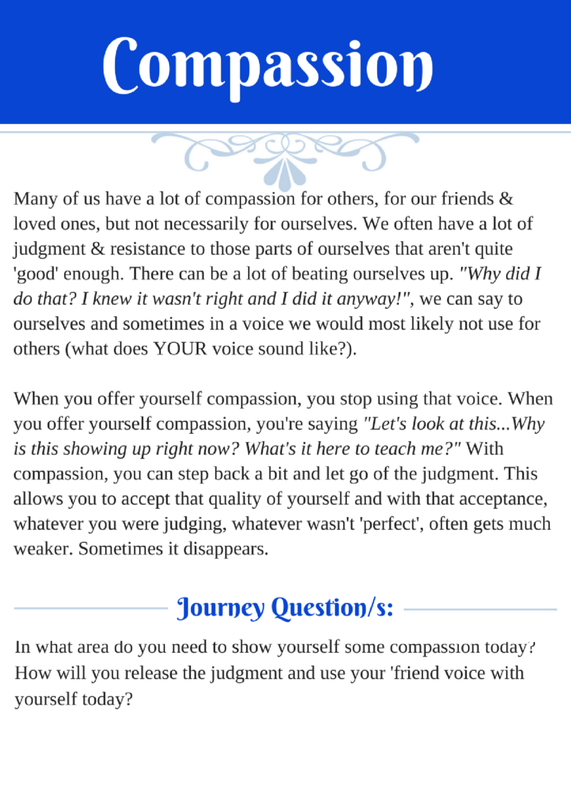 Text of the Compassion Card from the Mood Lady Card Set.